Nothing beats a hot creamy soup on a cold winter’s day, seen here with dinner rolls adapted from “Fascinating Foods from the Deep South,” the 1962 cookbook of Alline P. van Duzer, who ran the University Club dining room in Tuscaloosa for many years. Well, as you all probably know, Mother Nature got the last laugh and, after the subways had been shut down in anticipation of snow for the first time in their 111-year history, an 11 p.m. curfew was applied to the whole city (including bicycle food delivery people! ), and even the Nets and Knicks postponed their basketball games, nothing much really happened. I’ve always said it’s better to take a coat and not need it than to need one and not have it, and the Boy Scout Motto really is “Be Prepared,” but it was an awful lot of sturm und drang for what turned out to be a smattering of snow on a windy day. Nevertheless, it did get me to thinking about posting a soup recipe, and it was just about then that one of my in-laws called to get a refresher course on this recipe, which has been a Christmas tradition in our family now for nearly thirty years and goes down really well on a cold winter’s day. It was first introduced to me by my good friend and one of the most extraordinarily gifted cooks I’ve ever known, Allen Geesey, who was a year ahead of me at Birmingham-Southern, and deserves all the credit for this delicious concoction. 2) I’m leery of freezing this after adding the cream, so if you want to keep and freeze some of it for later use, freeze the base before adding the cream. Then, just heat up and add the cream when you’re ready to serve and you’ll never know the difference. 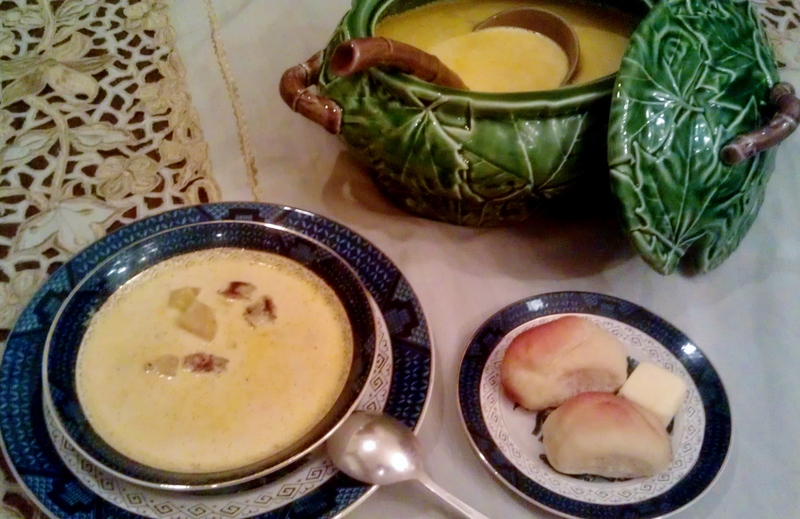 The finished soup with cream will keep in the refrigerator for several days, and it goes quickly. 3) Though we tend to use kielbasa in our family, most any sausage will do, though I’d advise against something as strong as Andouille since it will overwhelm the subtlety of the flavors. 4) I’ve made this point before, but be sure to wash leeks thoroughly before using. Leeks are kept white as they grow by piling up dirt around the stalks to keep them out of the sun, but the result is almost always sand and grit down in-between the layers. Nobody wants a gritty soup. Finally, I can already hear some of you saying, “Really?!? Two quarts of heavy cream?” To which I can only answer, yes. That said, you could substitute half-and-half and compensate by adding additional potatoes which will help to thicken the soup, OR use the trick a friend of mine has suggested where he uses a less concentrated base and swirls in just a couple of tablespoons of cream to the bowl before serving. “You’d be amazed at how well that works,” he said. Cut green tops and root ends of leeks off and discard. Slice remaining portion in ¼ inch round slices and place in colander to rinse thoroughly. Drain and set aside. Peel and dice potatoes into soup-sized pieces, cover with water to keep from darkening and set aside. Cut sausage in half lengthwise then slice halves into ½” slices to make soup-sized pieces. In a large stock pot or other large stew pot, heat the oil until fragrant and add sausage pieces. Brown until lightly browned on all sides. Remove from oil with slotted spoon or flat spatula to allow oil to remain in the pot, and set aside. Add all the leeks to the sausage-oil and cook, stirring frequently, until tender and translucent. Add chicken broth, chicken bouillon, drained potato pieces and salt and pepper to broth mixture and bring to a boil. Reduce to simmer and cook down for half an hour or so. Add sausage bits and continue simmering for another fifteen minutes, or until the flavor of the base is piquant and strong enough to stand up when diluted with an equal amount of cream. It should be twice as salty/flavorful as you want the finished soup to be. Stir in cream and heat just to boiling. 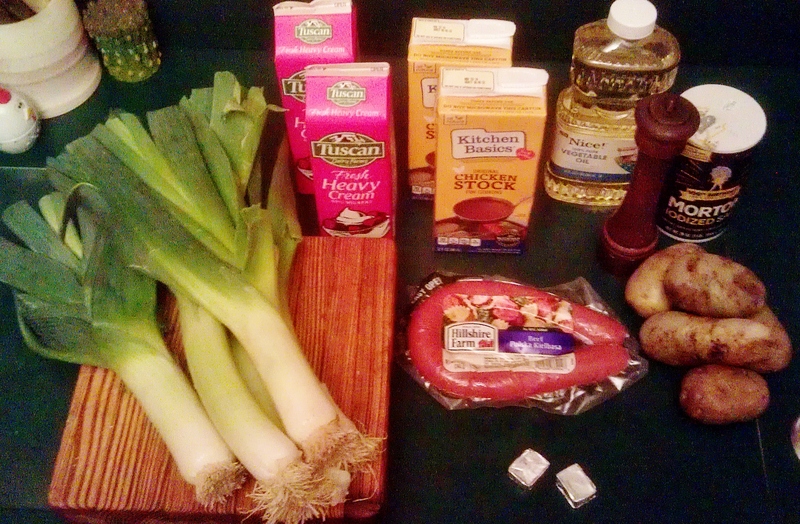 This entry was posted in Angels, cooking, Love, recipes, Uncategorized and tagged cream soup, leeks, potato leek soup, sausage, soup, soups. Bookmark the permalink.